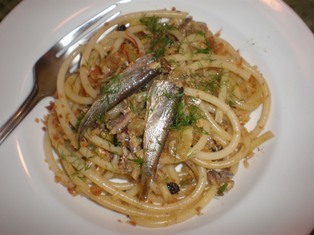 Spaghetti with Anchovies and Breadcrumbs. 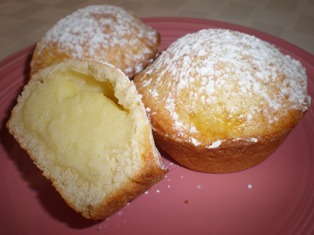 It is a traditional dish served on St. Joseph's Day, as his day is the feast of bread, with breadcrumbs symbolizing the sawdust in St. Joseph’s carpenter shop. 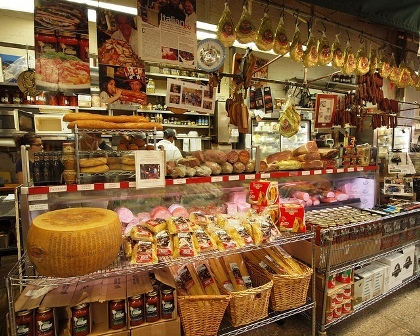 from many nations that left their influence on Calabrian food, traditions, and customs. The Arabs brought oranges, lemons, raisins, artichokes, and eggplants; all of which remain important ingredients in the traditional dishes of this region. Calabria is the land of the eggplant and tomato, and the region has the perfect growing conditions for them. There are almost no dishes that are made without peperoncini, whether fresh or dried, whole or ground, the red pods are seen everywhere. Beans are also important in Calabrian cuisine. Fava beans, picked fresh and shelled, are a delicacy that is often served with a glass of wine. Olives, fennel, and red onion are also some of the principal crops of Calabria. The onions are particularly mild and are used not only in stews and sautés but are also eaten raw. Although vegetables play a more important role than meat in this region, pork, lamb and goat are the dominant meats. The meat is often roasted with herbs and potatoes or made into a pasta sauce. Pigs are also a major source of sausage products. Surrounded by the sea, Calabrians enjoy tuna, swordfish, anchovies and sardines, as well as octopus, clams, and mussels. This is a basic Calabrian sauce that is the foundation of many dishes. 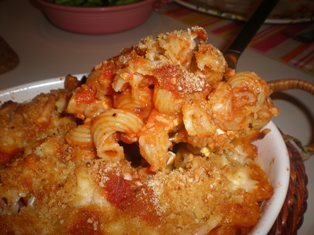 It can be served on its own with any pasta shape. 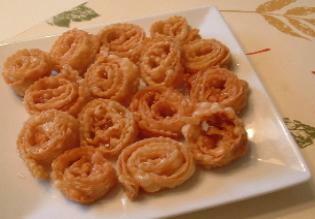 It can also be the starting point for the addition of many other ingredients. You can use fresh tomatoes or substitute one 28-ounce can of peeled tomatoes in their juice. 3-1/2 pounds fresh tomatoes, peeled, seeded, and diced. If you are using canned tomatoes, break them up by hand. If you prefer a smoother sauce, puree them in a food processor or blender. Heat the olive oil in a large skillet over medium heat. Add the garlic and saute until golden, about 1 minute. Add the tomatoes, basil, salt, and hot pepper. Simmer, stirring occasionally, until the sauce thickens, about 10 to 15 minutes. Sauce is ready to serve. 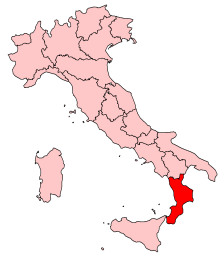 Calabria is the main producer and consumer of hot chili peppers, or peperoncini as they are called in Italian. 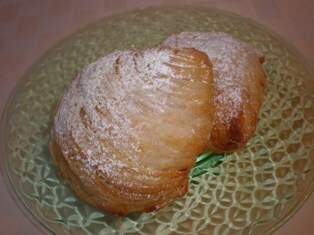 They are also called diavoletti or little devils. Whether fresh or dried, they lend their fiery character to countless recipes. The peperoncini plants thrive in hot climates; in fact, the hotter the climate, the spicier the fruits become. The berrylike fruits are first green and turn bright red or dark red when entirely mature. They can be used during all stages of maturity. In Italy, the medium-hot varieties seem to be preferred. The short veneti are either canned green or served broiled as part of an antipasti. The longer and slender lombardi are suitable for canning and when red and ripe are used for drying and as a staple seasoning that can be stored. When peperoncicni are ripe and red but not yet dried, they are lined up on strings and hung up to dry. While they are drying, they hang for decoration outside of homes and vegetable stands in southern Italy. The pods will maintain their heat and flavor even when dried. To clean the pods, wear gloves or be sure to wash your hands thoroughly after handling them. A Calabrian specialty is paparul crusch which are dark red pepper pods that are sun-dried in autumn and fried whole and served as an appetizer. For seasoning purposes, the pods are also crushed and sautéed in olive oil or added to dishes. In southern Italy, ground chili peppers are sometimes added to salami and cheeses. Also, hot peppers are preserved in oil to produce flavorful, spicy oil. To make a very hot peperoncini oil, put 5 to 6 very hot dried pepperoncini in one cup of olive oil in a glass jar. Leave at room temperature for about 2 weeks; periodically giving the jar a shake.Use a few drops of the oil to season and give spice to salads, pasta, pizza, beans, or stews with meat. Heat olive oil in a large wide saucepan over medium-high heat. Add the onion and sauté until soft. 3 to 5 minutes. Add the sausage, garlic, and red pepper flakes. Cook until the sausage begins to brown, about 5 minutes. Add the wine and cook until evaporated, about 3 minutes. Add the tomatoes, broth, some salt, and oregano. Bring the sauce to a boil, reduce to low, and simmer 30 to 40 minutes. 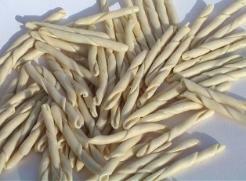 Cook the rigatoni in boiling salted water until al dente. Transfer the pasta to a colander to drain. Add the pasta to the sauce. Stir in the ricotta and Parmesan cheese. Season with salt and pepper. Toss to mix well. Transfer to a serving dish and drizzle with additional olive oil. Many Italians in the southern regions of Italy and Sicily add hard boiled eggs to their pasta. The eggs add another layer of taste to the dish along with some protein. Cook the pasta in boiling salted water for 2 minutes less than recommended time. Drain the pasta and put it in a large bowl. Add 2 cups of tomato sauce and half of the pecorino cheese. Stir gently to distribute the ingredients evenly. Preheat the oven to 400 degrees F. Grease a baking dish with the butter. Evenly spread half of the pasta in the baking dish. Peel and cut the eggs into 1/2-inch slices. Arrange the egg slices on top of the pasta. Scatter half of the provolone evenly over the eggs. 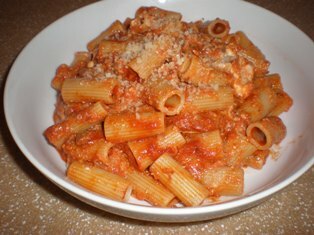 Spread one cup of the tomato sauce on top. Spread the remaining pasta in an even layer. Spoon on the remaining tomato sauce. Scatter the remaining pecorino and provolone on top. Top with the bread crumbs. Drizzle the top with some olive oil. Cover the baking dish with foil. Bake for 30 minutes. Remove the foil and bake an additional 20 minutes. The top should be golden brown and crusty.